In a season filled with unprecedented challenges, the West Linn boys basketball team faced one more in its 2018-19 season finale on Friday. The Lions — who dealt with a plethora of injuries, lineup changes, personnel defections, and finally, a coaching change, in 2018-19 — saw their season come to an end on Friday when they fell 73-52 to second-ranked South Salem at South Salem High School in the second round of the Class 6A state playoffs. "They're not very big — their biggest kid is 6-3 or 6-4 — but they're really athletic and they pressure for 32 minutes," said West Linn coach Tyler Toney, who announced his resignation from the Lions' program following the loss. "They get up and down the court and they have one of the best point guards in the state." With the loss, the 15th-ranked Lions finished their 2018-19 season with a 12-14 overall record after placing fifth in the Three Rivers League race. No. 2 South Salem, meanwhile, won for the ninth straight time and improved to 22-4 overall after earlier winning the Mountain Valley Conference championship. The Saxons will open the Class 6A state tournament against No. 7 Tigard (17-9 overall) at 8:15 p.m. Wednesday at the Chiles Center on the University of Portland campus. 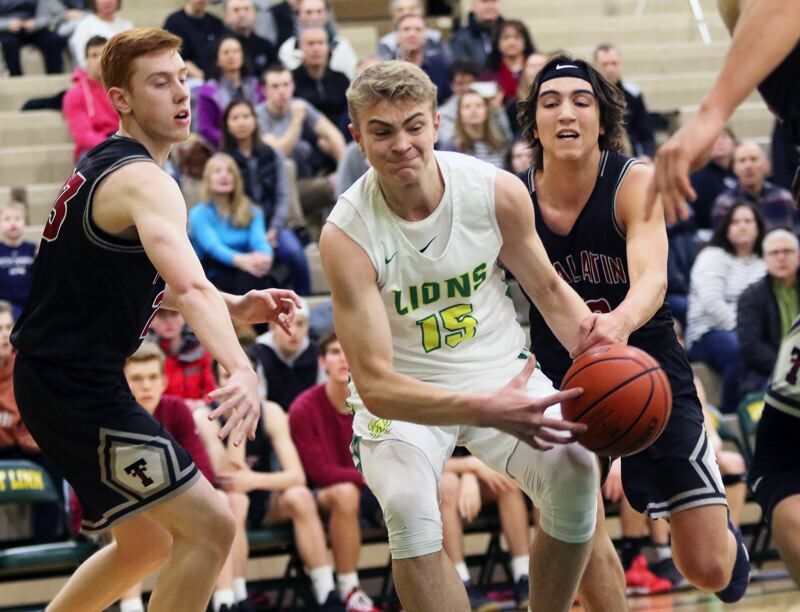 While the final score didn't favor West Linn, the Lions started fast against the talented Saxons, getting four first-quarter points from junior guard Gus Michelon and a 3-pointer from senior wing Cade Knutson to grab a 13-9 lead at the end of the period. Saxon senior Treyden Harris kept his team close by scoring seven of his game-high 21 points in the opening stanza. West Linn stayed ahead for a while in the second quarter, too, getting five points from senior wing Oreon Courtney and a "3" from junior Kelton Herrick. But the Saxons began to heat up on the offensive end in the second period, with senior Eric Lungu knocking down two 3-pointers, senior point guard Jaden Nielsen-Skinner scoring five points, and senior guard Ryan Brown and Harris adding four each, with Nielsen-Skinner's late 3-pointer pushing the South Salem lead to 31-23 at the half. "We got into a little bit of foul trouble (in the second quarter), and along with our injuries, they got rolling a little bit," Toney said. "It was a five-point game until (Nielsen-Skinner) hit a '3' to push it to eight. He's a really good player and he made a tough shot." Then, when the Lions began to struggle offensively in the second half — missing leading scorers Micah Garrett and Bryson Crockett due to injury and hamstrung by foul trouble that slowed Courtney, senior Parker Durbin and Herrick — the Saxons took off. South Salem posted a 16-9 scoring edge in the third quarter that extended its lead to 47-32 — getting six points from Harris and five by Lungu — then tacked on a 26-20 edge in the fourth to end West Linn's season. Nielsen-Skinner scored 12 of his 19 points in that final quarter to help his team pull away. "We got in some foul trouble — we ended up with three of our guys fouling out," Toney said. "Once we got down, with the team we had, we weren't set up to come back. "Their point guard (Nielsen-Skinner) was their difference. I'm trying to think if we played a better point guard this year and I don't think we have." For the game, Courtney — previously named to the all-TRL first team and the league's Defensive Player of the Year — led West Linn with 14 points and 11 rebounds. Junior post Joe Juhala added 12 points, two steals and a blocked shot, Michelon had nine points and Herrick six points and four assists. In addition to Harris' 21, Nielsen-Skinner added 19 and Lungu 15 in the win.